MFGG Isometric Collab: Happy WAH-loween! Quote: Wario and Waluigi welcome you to their haunted house, for a "small" fee of course. As they accept all of the coins in your possession, they welcome you into their haunted abode for a WAH-nderfully spooky time! Layout made using DDP's isometric blocks which were suggested during the Luigi Mini Iso Collab. Claim up to three tiles at a time by replying with each numbered tile you want. These are first come, first served. Please verify that these tiles are not already claimed in the list on this post or in below replies. 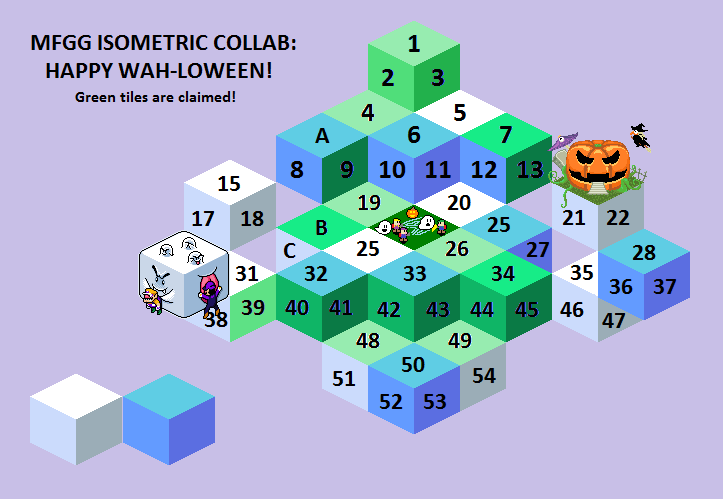 Using these tiles you may create isometric scenes featuring Wario, Waluigi and Halloween in some form. Set pieces can come from any Mario/Wario game as long as they fit Halloween and you feature either Wario or Waluigi in some manner. If there are no updates on your progress with your tiles within one week from when you requested them, other members may claim your tiles. When complete, upload your own tiles separately and I will manually update the image above to place your submission. Please do not upload as transparent PNGs or GIFs. Please upload your tiles separately and with the background color of the collab. If there are free tiles available after you've completed your initial two tiles, and each time you complete them thereafter, you may select up to two more. Starting simple, there are no style or pallete restrictions. However, your entry must be pixel art and may not be edited from existing graphics unless HEAVILY modified to the degree that the source material is unrecognizable. Please try not to obscure other tiles without communicating with the person who has claimed that tile. After all the tiles are completed and placed, we will work together to polish this and ensure all tiles flow together in a sensible way. for this, if it is completed! Hey that's me! That's my pumpkin!